Damian McErlain's Derry made it two Division Four wins from two with a comfortable victory over London at Ballinascreen. Derry made it two wins from two in Division Four after surviving a first half scare to stroll to victory over London at Ballinascreen on Sunday. The Oak Leafers' victory was never in doubt though they were made to pay for two slack minutes in the first half during which time the Exiles hit 1-02 to give themselves a first half foothold they scarcely deserved. 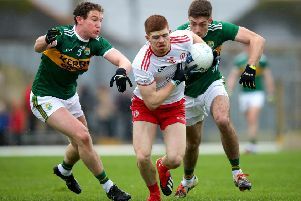 It proved a false dawn for Ciaran Deely's men though as Derry went through the gears in the third quarter to ensure even the loss of Conor McAtamney to a harsh second booking would have little bearing on the outcome. 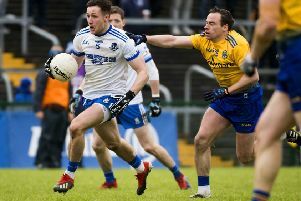 Dery manager Damian McErlain made two changes to the 15 that started against Antrim in Corrigan Park seven days earlier, Niall Keenan making a welcomed return for the injured Sean Francis Quinn and Jack Doherty coming in for Eamon McGill who was among the substitutes. As expected, London set up in damage limitation formation with first half goalscorer Adrian Hanlon often cutting an isolation figure as the only green shirt in the Derry half. he was picked up by Steelstown's Eoghan Concannon with Keenan and Chrissy McKaigue providing the cover in front. And with Ciaran McFaul impressively pulling the strings the first half was progressing as expected as McFaul, Patrick Coney, Christopher Bradley (2), Emmet Bradley forged a 0-5 to 0-1 lead with 134 minutes on the clock despite the loss of both Shane McGuigan and Enda Lynn to injury in the early stages. London had equalised through top scores Liam Gavanagh in the seventh point and when Killian Butler grabbed their second on 15 minutes, they were staying in touch. Derry's main danger though was their own levels on intensity. The home side were 0-8 to 0-3 up and had passed up a couple of goal chances when that London foothold almost became a grip on the game between the 28th and 30th minutes. First, a lovely surging run and score from Ryan Jones brought it back to 0-8 to 0-4 but when London then won the kick-out, a superb ball in by Butler brilliantly picked out Adrian Hanlon who held off Concannon, spun and fired past Thomas Mallon to shock most in Ballascreen. And it got even better when David Dunne tagged on a superb long range score to tie the game with fives minutes of the half remaining. But that would be as good as it got for the visitors. Stung into action once more, Derry rallied with Emmet Bradley coming to the fore. Two superb points from the Glen player sent Derry in leading 0-10 to 1-05 but they warning signs had been heeded. A sharper Derry emerged in the second half to outscore London 0-8 to 0-1 over the third quarter, taking the game away from London. Early scores from Christopher Bradley and McFaul set the tone. Conor Doran responded for the Exiles but London attacks were becoming more infrequent as the half progressed. Emmet Bradley continued his own impressive display on the way to a personal haul of 0-7 with Niall Toner, an early first half substitute, doing his own chances no harm with an excellent cameo and two points. The one black spot was McAtamney's dismissal. His first booking came on 52 minutes for a pull on Gavaghan as he tried to break but the second, minutes later, for an innocuous scuffle with Ronan Devlin barely deserved a ticking off. As it was, both players were booked and the Swatragh man was gone. It made little difference to the score other than to help London to a couple of late scores. Derry were content to keep possession and see the game out with a long trip to Waterford to come next week. Derry: Thomas Mallon, Patrick Coney, Jason Rocks, Eoghan Concannon; Karl McKaigue, Chrissy McKaigue, Niall Keenan; Conor McAtamney, Ciaran McFaul; Emmet Bradley, Padraig Cassidy, Jack Doherty; Shane McGuigan, Enda Lynn, Christopher Bradley. (Subs) Niall Toner for S McGuigan (inj), 5mins; Paul Mcneill for E Lynn, 22mins; Conor Doherty for C Bradley, mins; Padraig Mc Grogan for J Doherty, 62mins; Christopher Bradley for e Concannon (inj), 74mins. London: Daniel McDonagh; Philip Butler, Michael Clarke, Matthew Moynihan; David Carrabine, Aidan McGarvey, Ryan Jones; Ryan Forde, Adrian Hanlon; Liam Gavaghan, James Hynes, Barry Tully; Matt Gottsche, David Dunne, Killian Butler.